A long list of features does not tell the whole story. A really great application has a natural, intuitive flow to it. This is what we strive for. You can be the judge on how far we have come. In the "Try it" section below, we have arranged for you to have complete access to two conference's applications and data. Seeing is believing. We understand you might not have an iPod Touch, iPhone or iPad to try it yourself or you may have a group that wants to experience it together, so we also offer a live online demo of our app through Webex. See our "Demo It" section for details on how to arrange it. 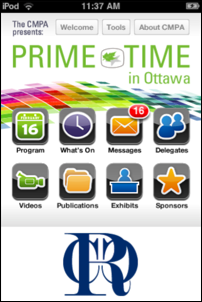 PrimeTime 2013 is a multi-media rich conference for Movie, TV and digital media companies and professionals. Filled with the best sample videos the members can produce as well as conference information, it is a great example of how this technology can be used for film festivals, conferences, etc. It is our fourth year making a paperless conference for the CMPA. You will need a demo account. Please contact us using the link at the bottom of this page for temporary credentials. On May 1, 2010, the AANS became the first North American medical association to hold an entirely paperless annual scientific conference and trade show. It was so well received the AANS won the Trade Show Executive's 2010 Innovation Award. We were delighted because we believe we build our reputation by helping our clients build theirs. In 2011 and 2012 they did it again, with all the second and third generation improvements you might expect. In 2012 and 12013 they offer both the iOS and Mobile Web Browser versions to their attendees. 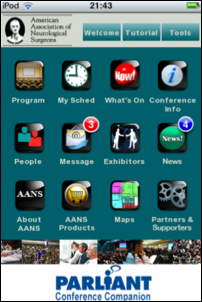 To download the iOS Version of the current AANS App click here. No account is required to run all but the messaging section of the app. There is a lot of data that goes with this app, Powerpoints for sessions and e-posters, videos of surgeries, video advertisements from the exhibitors, all forms of media, session support and conference logistics support. "Entirely paperless" includes the exhibitors, speakers and show staff. Be sure to have 1.5 GB of room on your device before running the app the first time and make sure you are on WiFi or you could have a big 3G wireless bill next month. You can read more about it here in an article produced by magazine Meetingsnet. Conference Companion has a wealth of features that you can pick and choose from to match your meeting's workflow and offerings. The above two examples are representative but are by no means demos of all of Conference Companion's capabilities. GIve us a call. We would be happy to discuss your needs. Once you have gone through the material above, you can arrange a live Webex demonstration where, through screen sharing, we will walk you through the actual iPod touch App. If you prefer, you may CONTACT US using a secure web form that allows you to attach files about your conference if you like. > Try it. Demo it.